Pressure washers are ideal to wash, sanitize, degrease and disinfect, any external surface, with a high pressure jet of water. They are compact, quick and easy to use, and ideal for any outdoor cleaning tasks in various environments such as agriculture, industrial, marine and shipping, car washing, and the transport industry. 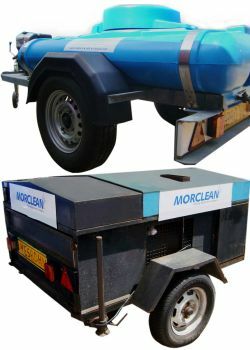 In addition to hiring out pressure washers, vacs and steam cleaners etc, Morclean HIRE have a comprehensive fleet of specialist and unique cleaning equipment. Our range includes our Hirajet trailer or bowser mounted pressure washers and jetters; our Sitemaster range of hot or cold water mobile plant, portable engine driven hot water and steam cleaners, as well as a selection of unusual and niche products for specialist applications in various industries. Due to the volumes of new machines sales and part exchanges we deal in, we always have new and used stock available and access to and extremely comprehensive range of steam cleaners, vapour steam cleaners and high pressure jetters. Few hire firms in the area can boast such a specialist fleet and we have such a wide range of specialist jetters or high pressure cleaners. Backed by our European partners we're also able to provide UHP (ultra high pressure) or high volume steam units. We also hire out Self Contained Water Bowsers and Baffled Water Tanks.